We continue to review Wine of Moldova, and we are back to the wine blend theme. 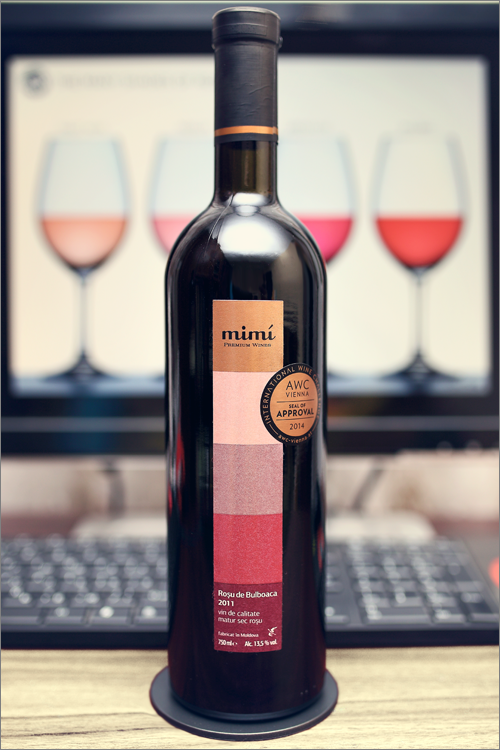 Tonight we will review a wine that has quite a renomé on the internal market – Rosu de Bulboaca from Mimí. This wine is different from the many other blends, for it is made up in a similar way as a Bordeaux blend, but it is not a classic Bordeaux at all, because unlike the other Bordeaux blends, here merlot is designated as the primary variety, while cabernet sauvignon gets the secondary, complimentary role. The wine has a deep-clear garnet color, with the rim-color of a pure and translucent garnet shade. The nose is clean and strong, with no signs of wine faults. The first nose brings very clear and nuanced notes of black fruits and spice: sour cherry, black cherry, black plum, black currant, black mulberry jam, blueberry and red mirabelle. A bit later comes secondary notes of dried cherry, black pepper and medium roasted wood. The wine is dry with no signs of residual sugar. It has high, quite well integrated alcohol level, high-minus acidity and dry tannin. This is an expressive and powerful wine – bitter-tannic, aggressive and spicy – a good example of a big, bold, full bodied wine. The wine has a good overall balance – it feels muscular, austere and woody. The wine has a long finish and velvety-sharp aftertaste. It is bitter and spicy towards the end, but it leaves a quite pleasing feeling overall. This is definitely a fine Wine of Moldova and the overall rating says the same, with 88.8 points scored it is right there, among the best wines we’ve tasted so far. Please click on the chart icon on the left in order to get to the wine rating page, where you can find all the wines we’ve tasted to date. Last but not least, we would like to mention that this is that kind of wine that will express itself better if decanted at least 30 minutes before serving. Also, we’ve noticed that this wine tastes smoother if served a little cooler than recommended (14°-15°), but at the same time it has a richer flavor if served warmer (16°-18°). There’s something else to add here – Bordeaux blends are a real delight if you like those bold, muscular wines, and, as we’ve found out tonight, merlot and cabernet sauvignon, can be used both, as a primary, as well as a complimentary grape variety, while making the final blend. You are to decide which way is your way.